CBN POW Week V: Vladimir Guerrero Jr.
Vladimir Guerrero batted .409 (9-for-22) with three home runs and nine RBIs to earn Canadian Baseball Network Player of the Week for Week V.
There is a gigantic push to promote third baseman Vladimir Guerrero from the double-A New Hampshire Fisher Cats to the majors. If Guerrero is promoted what do the Jays do with former American League MVP Josh Donaldson and his healthy right shoulder? We don’t see Donaldson about to head into free agency agreeing to spend most of the remainder of the 2018 season at DH. As ring announcer Jimmy Lennon used to say at Madison Square Garden ... nevertheless ... Guerrero is our Canadian Baseball Network minor league Player of Week for Week V.
Guerrero was born in Montreal March 16, 1999, 20 days before his father’s Montreal Expos opened the season playing the Pittsburgh Pirates at Three Rivers Stadium. This week he batted .409 (9-for-22) with three home runs and nine RBIs. Guerrero was signed by former Blue Jays general manager Alex Anthopoulos (Montreal, Que.) and current Blue Jays assistant GM Andrew Tinnish (Ottawa, Ont.) who gave the son of the Hall of Famer a signing bonus of $3.9 Million US. 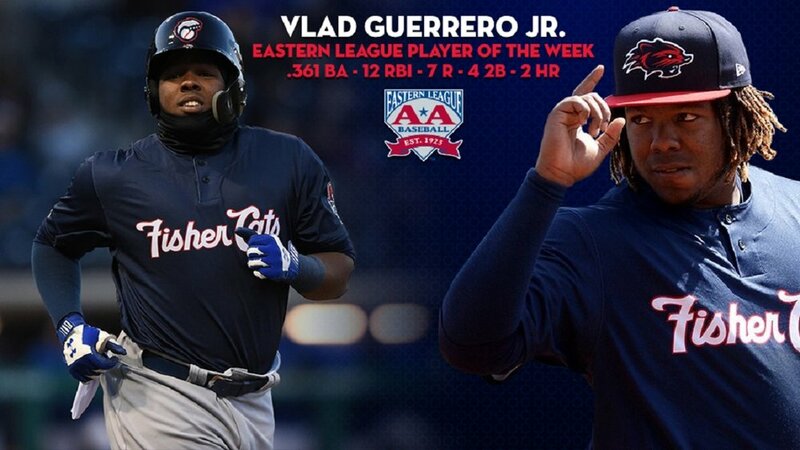 Guerrero was also named Offensive Player of the Week in the Eastern League, the second time this year he has won the Award. _ A pair of hits including his third homer of the season in a 10-6 loss to the Binghamton Rumble Ponies before 1,450 fans at NYSEG Stadium at Binghamton. Guerrero singled and homered off Mickey Jannis, 30, a 44th round pick from Cal State Bakersfield. _ Two hits including a double in a 6-5 victory over Binghamton in the first game of a doubleheader. Andrew Case (Saint John, N.B.) pitched a scoreless seventh for his second save. _ Had two singles as the Fisher Cats won 4-2 to sweep the doubleheader before 4,257 fans at NYSEG Stadium. RHP Jordan Romano (Markham, Ont.) started and got the win moving to 5-0. He allowed two runs on two hits and four walks in 5 1/3 innings. He fanned six in his 88-pitch outing. The win moved Romano to 5-0 with a 2.57 ERA. Conor Panas (Toronto, Ont.) also singled for New Hampshire. _ Homered twice and drove in five runs in a 10-2 win over the Portland Sea Dogs in front of 3,008 fans at Northeast Delta Dental Stadium. Guerrero hit a three-run homer to left in the first facing Kevin McAvoy, 24, a fourth round pick from Bryant University. And five innings later he took Jake Cosart, 24, a third round pick from Seminole State College, a two-run shot to left centre. Panas doubled for New Hampshire. _ Singled in a 5-3 loss to Portland in front of 3,644. Panas singled for New Hampshire. Operating at the back end of the San Antonio bullpen, Rowan Wick has performed very well. This week he made two solid relief appearances, the first on May 3 in a 13-6 win over Frisco Roughriders when he pitched one scoreless inning, while striking out two Frisco hitters. He was not involved in the decision. On May 7, in a 5-4 victory over Corpus Christi Hooks, he threw two scoreless surrendering only one base hit, while striking out three Hooks batters to earn his second win of the season. His overall record with San Antonio in 11 Texas League appearances is now 2-1, with one save and a 3.55 ERA. Conor Lillis-White is currently active with Mobile Bay Bears the Los Angeles Angels affiliate in the double-A Southern League, and the 25-year-old Toronto native has performed very well in his first year at this level. This week he made two relief appearances the first was on May 3 in a 4-1 loss to Chattanooga Lookouts, in which he threw 2 2/3 innings, gave up three base hits and one earned run while striking out five Chattanooga batters, but was not involved in the decision. On May 7, in a 5-0 win over Mississippi Braves, he pitched three scoreless, gave up zero hits, while striking out eight Braves hitters, but again was not involved in the decision. His overall record for Mobile in nine Southern League appearances is now 0-0, with two saves and a 4.60 ERA. Curtis Taylor has made the adjustment to a new organization this season, and has pitched strongly for Charlotte Stone Crabs, Tampa Bay Rays affiliate in the class-A Advanced Florida State League. This week he made two relief appearances, the first on May 3 in 1-0 win over St. Lucie Mets when he threw 2 2/3 scoreless innings, allowing one hit, while striking out three St. Lucie batters, to earn his third win of the year. On May 7 in a 7-5 victory over Ft. Myers Miracle he pitched three innings, surrendered three base hits and one earned run while striking out eight Ft. Myers batters, to pick up his second save of the season. His overall record in eight appearances for Charlotte now stands at 3-0, with two saves and a 3.12 ERA. This week Jordan Romano won his fifth game of the season, and his current level of pitching consistency along with that of battery mate Sean Reid-Foley who also has five wins, bodes well not only for the Fisher Cats in the short term, but also for the Toronto Blue Jays in the long term. On May 5, in a 4-2 win over Binghamton Rumble Ponies, Romano threw 5 1/3 innings, gave up two base hits and two earned runs, while striking out six Binghamton batters, to pick up his fifth win of the year. His record with the Fisher Cats is now 5-0 with a 2.57 ERA. Week 1 _ OF Tyler O’Neill (Maple Ridge, BC) Memphis (Cards) and Josh Naylor (Mississauga, Ont.) San Antonio (Padres). Week II _ RHP Jordan Romano (Markham, Ont.) New Hampshire (Blue Jays). Week III _ RHP Mike Soroka (Calgary, Alta.) Gwinett (Braves). Week IV _ RHP Brock Dykxhoorn (Goderich, Ont.) Corpus Christi (Astros). Week V _ Vladimir Guerrero (Montreal, Que.) New Hampshire (Jays).